FireMaster® FastDoor XL | GarCo Manufacturing Co., Inc.
A duct access/inspection door solution with built-in fire insulation providing fire performance equal to the FastWrap® XL wrap system. Fire tested as an integral part of the FastWrap® XL system and unique to Morgan Thermal Ceramics. 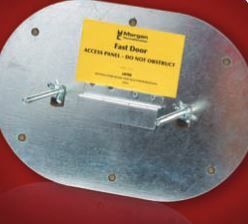 This entry was posted on September 3, 2015 by GarCoMfg in Insulation, Products, Safety/Fire Protection, Specialty, Thermal Ceramics and tagged Duct Access, FastDoor XL, FireMaster, Morgan Thermal Ceramics.